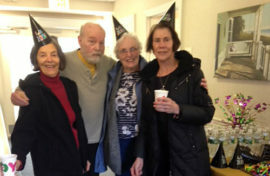 Marion, MA (January 8, 2019) – Residents at Little Neck Village in Marion rang in the new year early-bird style with a “New Year’s Eve Day Breakfast Social,” complete with hats and noisemakers along with coffee and pastries! In all, over 30 residents attended and a great time was had by all. Pictured (left to right): Mary Lucas, Bill Bradford, Deborah Bush and Suzanne Peterson.